"NO" represents units in the first building which don't need to receive any wireless from my network. I don't care if they do, but it isn't necessary to attempt to provide it to them. The little joystick-looking things are the current positions of the two wifi routers described in this question. They both run dd-wrt and while the upstairs AP is responsible for both providing wireless to the unit it is in and also providing it to the client bridge downstairs, the downstairs client bridge immediately forwards the connection to a wired lan so it has no rebroadcasting responsibilities; it only has to maintain a good wireless connection with the AP upstairs. Therefore the upstairs AP has two antennae, one oriented towards the interior of the unit it is in and one oriented towards the downstairs client bridge across the gap. Both antennae are just the little standard antennae that routers ship with. The client bridge downstairs has a single (cheap, waterlogged and in need of replacement) outdoors antenna of the patch form factor with its flat surface approximately oriented towards the upstairs AP. Currently, the network link between the upstairs AP and the downstairs client bridge maxes out at around 18Mbit/s on a good day. It seems to me that with the correct antennae and orientation they could do 54, especially if I bring the second AP antenna outside and use antennae with a little more directionality. 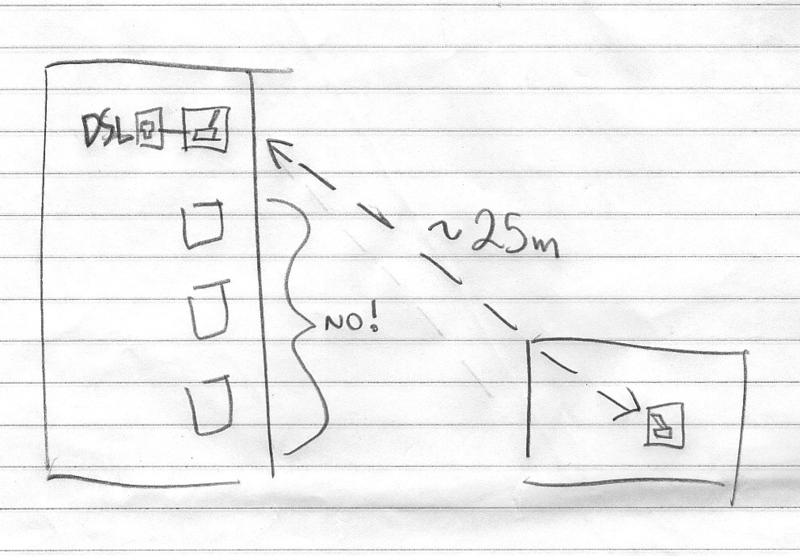 What is the optimal antenna form factor for creating this 25m line-of-sight link, without overkill? Please include details such as how to know if a particular model is sufficiently weatherproofed since they both should be outdoor antennae. Please be very specific, if you don't mind. As Joel Coel said, you really need to put a proper directional antenna on both ends of your system if you're having problem getting your signal (indicated signal strength) at the far-end of the link to meet your requirements. You are not required to run 802.11n over the 5GHz band, but if you elect to do so to avoid interference you will probably have no problem with 20-30M transmission distance. Not the answer you're looking for? Browse other questions tagged networking routing wifi or ask your own question. PoE powered WiFi access point? How to configure DHCP for wireless clients on TP-Link N Modem Router?